The key to improving your photography skills isn’t necessarily buying expensive or fancy cameras. 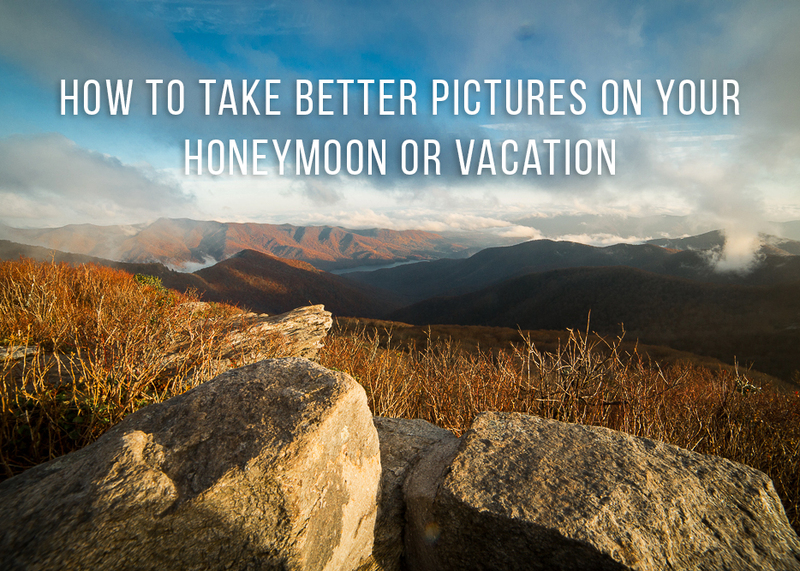 Besides, most people don’t want to lug around a big camera while they are on vacation anyway. (I certainly don’t!) You can actually get great photos on your phone as long as you know a few key things: the limitations of any camera, how to work around bad light and find great light, and basic rules of composition. Cameras can’t reproduce a scene in exactly the same way that we see it with our eyes. Our brain actually fills in information for us, allowing us to see way more detail in a scene than a camera could reproduce. The best example of this would be a landscape with patches of bright sunlight and shadow. When we look at such a landscape with our eyes, we see the areas that are in shadow just as clearly as we see the areas that are in bright sun. Sure, those areas look darker than the areas that are in bright sun, but the difference is not super stark. However, when we photograph that landscape you will notice that if you set your brightness (look for a sun icon or a + / – icon) so that the sky looks nice and blue (exposing for the highlights) you will notice that the areas in shadow look REALLY dark with almost no detail. Alternately, if you set your brightness so that you can see detail in the areas that are in shadow, (exposing for the shadows) the blue sky will now look white. You may scratch your head and say, “But those shadows don’t look so dark to me. I can see the blue sky and lots of detail everywhere.” The thing is, the camera just can’t replicate what your eyes see in such a high contrast lighting situation. Now you may be saying, what about HDR? 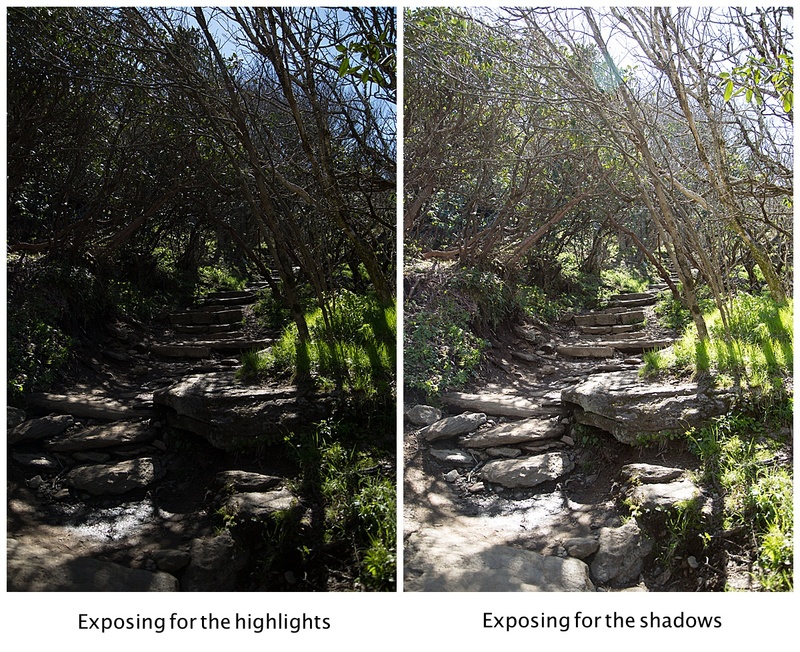 Yes, HDR (or High Dynamic Range) does allow you to get more detail in the highlights and shadows simultaneously, but in general, you are going to get better results by following the tips below. Feel free to experiment with HDR for landscapes and even portraits. But, that is no replacement for knowing how to identify beautiful light. So, that leads me to my next point. When you are ready to take a photo of you and your sweetheart or family, you’ll need to know how to avoid difficult or impossible lighting situations, based on what we know about the limitations of any camera. If, for instance, you want to take a photo of the 2 of you with a building in the background, you need to consider the lighting on the background (the building) and the lighting on the subject (you and your partner). A good rule of thumb is to match the amount of light that is falling on the background to the amount of light that is falling on the subject. For example, if the background has full sunlight falling on it, you will also want to be in full sunlight. (More on this below.) An even better situation would be to find a background that is in shade and then stand in a place that is also in shade. This way you will be able to look into the camera without squinting. As long as both the foreground and background are both in full sun or are both in shade, you will have a balanced photo. If you are photographing in the shade, it’s ok if there are small patches of direct sun in the background, as long as the entire background isn’t in direct sunlight. Photographing portraits in full sun is sometimes necessary. You may be on the beach (like in the example below) and want to have the gorgeous water in the background. If this is in the afternoon, it’s probably really sunny. The best way to get around the issue of squinty eyes is to throw on some sunglasses and face the sun. That way, you will see the water in all of its glory and you won’t be squinting in your photo. Another tough lighting situation is dappled light. This is light that falls through trees and creates spotty light. This is a no-win lighting situation. If you face the sunlight in this scenario you and your partner will look like leopards! The light will be too uneven and you may be blinded by a patch of sun like I am in the example below. A quick fix for this is to face your back to the sun so that your faces are completely in shadow. As long as the sunlight behind you is not too bright, you can set your brightness so that you are your partner look good and shoot away. If either of you has blond hair, you may not want to stand in a place where the sun is super bright on the back of your head. You’ll look like you have a halo around your head if you stand where the sun is strong! This is because light hair will reflect more light than dark hair. If the dappled light has large patches of shade, it might be possible to do selfies or portraits of 1 or 2 people in that patch of shade. By the way, all of these tips can be used whether you are doing selfies or having another person take the photo for you! So, if we know what bad light looks like, how do we find good light? For outdoor portraits, the best time of day to take pictures is about 1 hour before sunset or about 30 minutes after sunrise. That is because the sun is low in the sky and shade is plentiful. But, honestly, if you can find solid shade (shade with no patches of sunlight) you are in business. Here’s an ideal lighting situation for you. A patch of shade with a white wall or building directly across from it that has direct sunlight falling on it. The selfie of me above was taken in this kind of scenario. (example on the far right) Why is this so awesome? Well, that white wall is a huge diffused light source and therefore produces very soft and flattering light. Have your subject face the white wall and you will have amazing catchlights in the eyes and you may even get a little bit of backlighting on your hair, like in the example below. Catchlights are the reflection of the light source in the subject’s eyes. Catchlights are important because they bring life to the subject’s eyes. The backlighting in the example below gives more dimension to the otherwise even lighting situation. Inside, the best thing you can do is to face the window light and make sure that you don’t have any strong lighting falling on your from above or from a nearby lamp. Window light is another soft light source, as long as there isn’t bright sun streaming through the window. 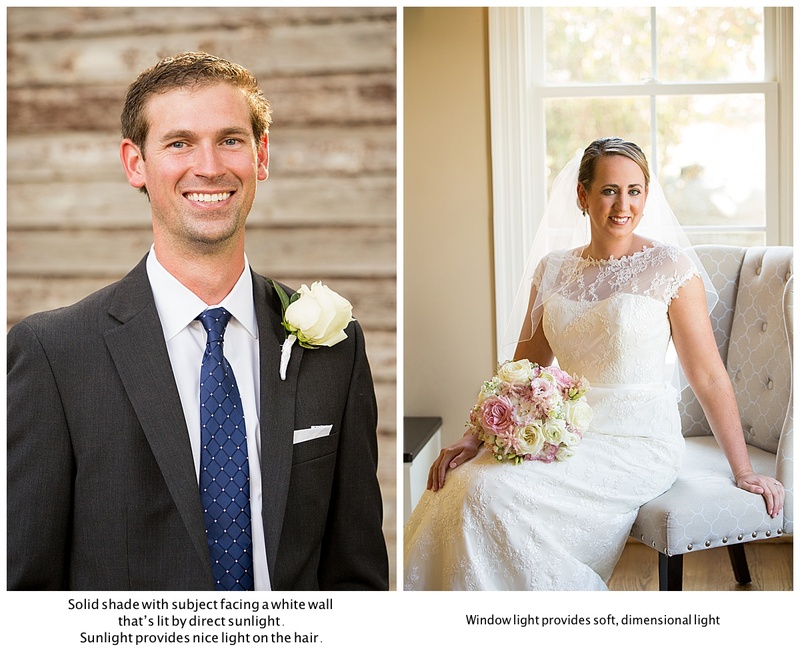 You can either face the window directly if you don’t want much shadow to fall on your face or you can angle away from it slightly to create shadow on your face, as seen in the photo of the bride below. If you divide your frame up into thirds both vertically and horizontally, those lines and the places where they intersect are ideal spots to place the focal point of your image. The focal point is simply the area in sharp focus and where you want to direct the viewer’s attention. In the case of a landscape, it may be a boat in the water or in the case of a portrait, it would be the eyes of a person. In the examples below, you can see the gridlines overlayed over each image. 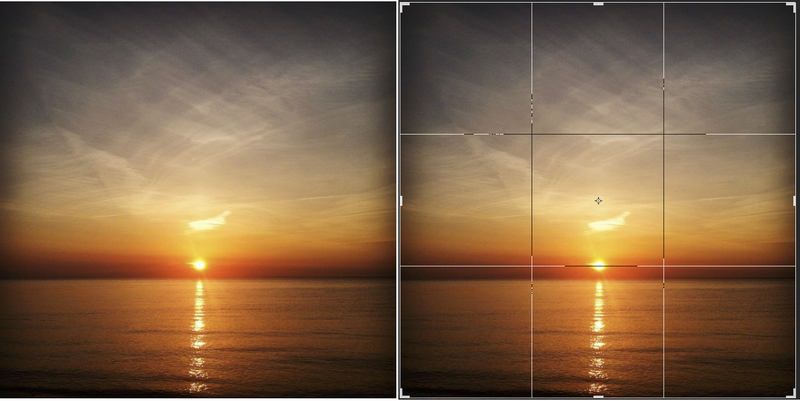 These gridlines divide the frame into thirds and are usually available to view while shooting with your phone. Practice placing your focal point along these lines or where the lines intersect and you will start to create more interesting compositions!